Good morning, USA! I've got a feeling you're gonna be seein' some card battles today! Ever wished you could watch Hank Hill duke it out with Leela or Lois Griffin? It looks like that may well soon become a reality with Kongregate and Fox Digital Entertainment joining forces for a brand new CCG that boasts one of the most impressive crossover casts you've ever seen. 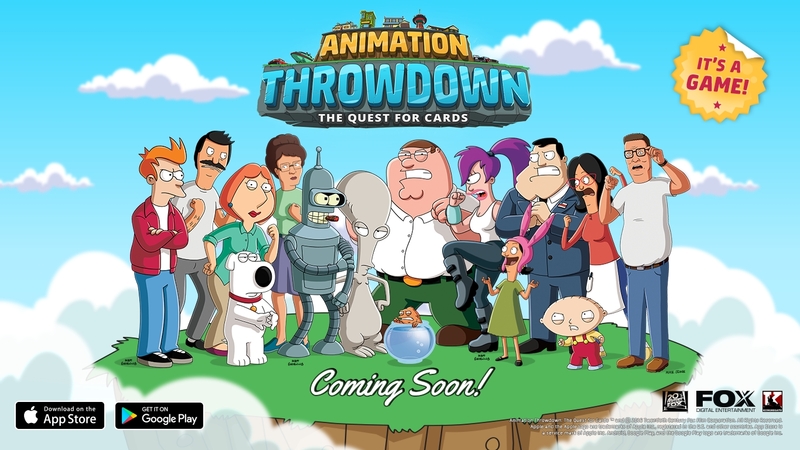 It's called Animation Throwdown: The Quest for Cards, and it'll feature Bob's Burgers, Family Guy, Futurama, American Dad, and King of the Hill. Even though King of the Hill and Futurama are no longer airing, it's interesting to see them included in this lineup. If you can collect all of these characters and make them battle each other by way of cards, it's going to be freakin' sweet, to turn a phrase used by everyone's favorite TV dad...er, mine, anyway. There aren't that many details out there beyond the fact that this up-and-coming title is indeed a game as the promo image proclaims, but rest assured it's probably going to be one you'll want to get started collecting cards from early. Trust me on this one.